Heat gun removes layers of paint. Dana gutted most of the walls herself. New wood windows look out upon new garden. When Dana purchased her Portia Street home in May 2000, she devised a five-year plan to restore the original charm and character that had pretty much been stripped away from the Spanish-style house. If that wasn’t ambitious enough, Dana planned to do most of the renovations herself—along with the help of family and friends—while holding down her regular job. Well, more than three years later, Dana is more realistic about restoring her home and her five-year plan. 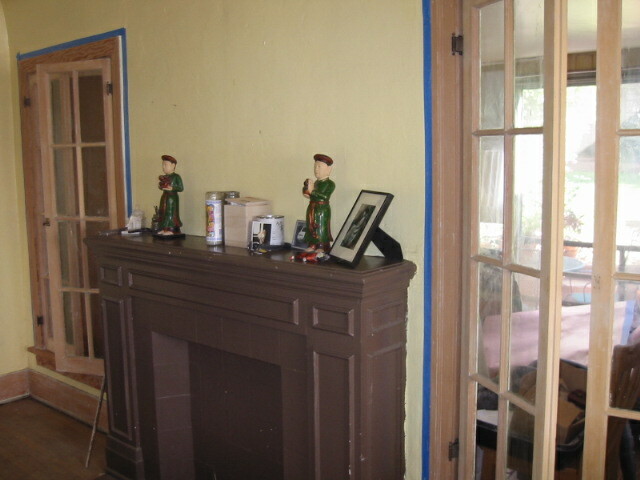 For instance, she is now paying someone to help her strip paint from woodwork, a time-consuming and tedious job. On top of that, Dana was surprised to discover that the previous owner had left behind their dog, Bobo, which she adopted. “I just wanted to try and bring back some light and life back into the house,” she said. Dana focused first on some basics, like replacing the leaky roof and installing gutters to spare the house from any more water damage. She also replaced the water heater and about half of the electrical system. With her handy heat gun, she removed much of the vinyl flooring and has removed thick layers of paint from moldings and other wood trim. 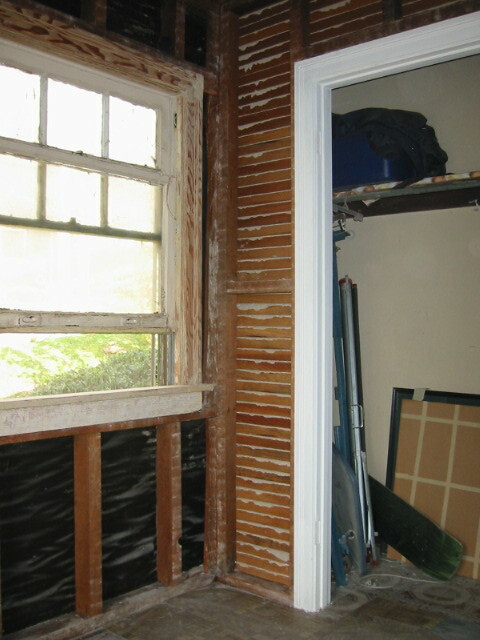 She has also done a lot of the demolition work herself, removing wood paneling, damaged plaster and wood lath. That saves money and helps the electricians, carpenters and other skilled professionals to do their work faster. One of the biggest changes has been the installation of new wood windows in some of the rooms, opening up what had been some dreary spaces. Those windows now frame a newly landscaped backyard complete with a new lawn, fruit trees and fencing. So far, an estimated $30,000 has been spent on renovation and restoration. That amount does not reflect the free labor Dana and others have provided. The next couple of weeks will see some more dramatic changes as several more wood windows, including a set of French doors, are installed. Also, the broken gas fireplace in living room will be replaced with a wood burning model and new tile will be installed around the hearth. After these improvements, Dana plans to take a breather before she takes on a kitchen and bathroom remodel. “I’m going to sit back and enjoy it,” she said. Dental Tools: The angled metal picks your dentist uses are also handy at digging out paint out of crevices in wood moldings and between bricks. Dana found her tools at a swap meet. 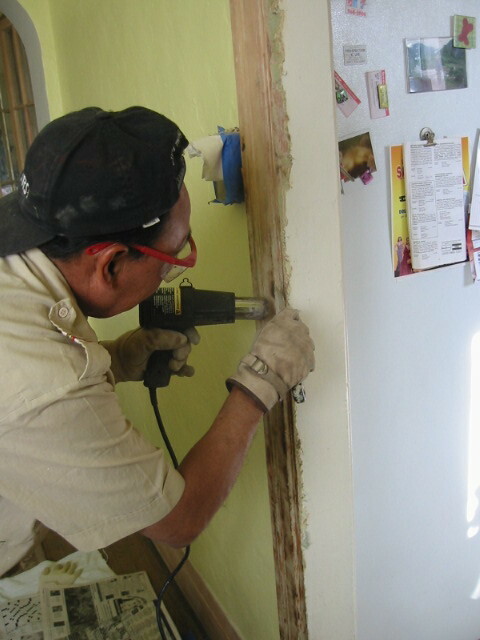 Heat Gun: low-temperature gun along with a putty knife have removed countless layers of paint. Utility Sink: The deep sink is perfect for cleaning up after a day of heavy duty restoration. Carpenter Ken Trenowski (818-500-7306) for window installation and other projects. 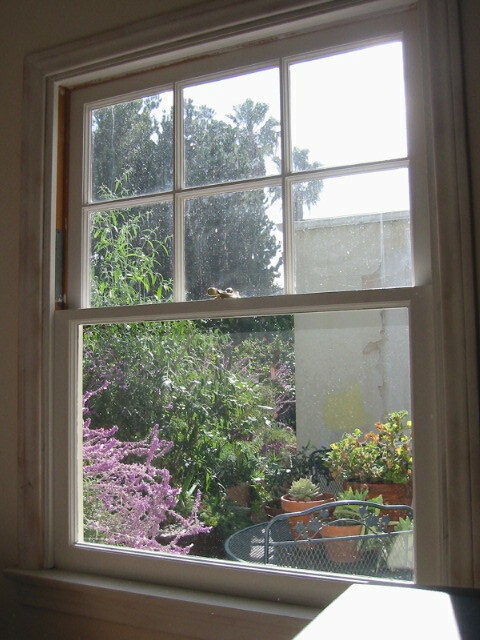 Glendale Mill (323-245-3725) for custom made wood windows. How long does it take to strip paint from doorway trim? About two days with a heat gun, steel wool if you have multiple layers of paint. How much did the wood windows cost? About $800 (materials and installation) for each 3-foot by 4-foot window (double-hung).